Alex Parker secured two top-10 finishes at the National School Games. The Skegness Swimming Club member is part of the Pentathlon GB Talent Programme and trains at the Yorkshire Pentathlon Centre at Bishop Burton College in Beverley. At the beginning of the summer he won the Yorkshire region laser run championship (shooting and running) and also the Yorkshire region modern triathlon (shooting, running and swimming). His excellent performance in the laser run subsequently gained him place in the top-20 athletes from the UK to compete at the National School Games at Loughborough University. Representing the North of England, Alex was delighted to finish eighth in the individual competition (with a 42 second personal best). He also came ninth in the mixed pairs. Alex also got to meet GB Olympians such as pentathlete Kate Allenby and rower Katherine Grainger. Not to be content with this, Alex also recently competed in and won the Louth Aquathlon (400m swim and 5,000m run), retaining his title. 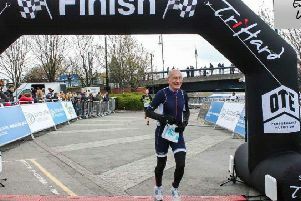 He will compete in the National Modern Triathlon Championship in Nottingham on Sunday. Alex is keen to involve the Skegness community in his sporting journey and is hoping that some local businesses will be willing to sponsor him. Further details are available from Andy Parker on andyjparker487@gmail.com.